Dolores Cannon, pioneering hypnotherapist, inventor of Quantum Healing Hypnosis Technique (QHHT) and author was born in St. Louis, Missouri, USA in 1931 where she lived and grew up with her family until completing her academic studies. She married her husband Johnny in 1951, a career US Naval man with whom she spent the next 21 years traveling all over the world for his various overseas assignments. Together they raised their four children and Dolores was a typical navy wife throughout the 1950s and 1960s. Dolores and Johnny also began to use hypnotherapy in the 1960s and from there Dolores developed her own unique Method designed to take people into the deepest possible levels of hypnosis, called the Somnambulistic state. A Grandmother and even a great-great Grandmother, Dolores was also the Grandmother and pioneer in the field of hypnosis. She had spent the past half-century working with thousands of people and had developed her own unique form of healing (QHHT) with wonderful and powerful results. Her healing work using QHHT was important to her but the demand for it is so great that she traveled the world teaching about all the information from her many clients as well as QHHT which is being enthusiastically embraced by people from all walks of life in every nation, as this method of healing is being recognized globally for its power to heal, sometimes miraculously. Quantam Healing Hypnosis Academy is the only authorized training provider who may teach Dolores’ method and there are now hundreds of people practicing QHHT worldwide who are likewise noticing that the results can be spectacular and life changing if it is appropriate for them to be healed. QHHT is unique in that it engages with what she called the Sub Conscious, or what is otherwise known as the Higher Self. It was this that Dolores and her Practitioners connected with as it has all the answers and sees everything. It has the power to heal instantly or to help the person to remember how to heal themselves. In addition to her healing work, Dolores Cannon was also founding President of Ozark Mountain Publishing, a company she began in 1992 in response to the many hurdles she faced in trying to have her own books published in a world which, back then, had not yet embraced the kind of information she wanted to share with others. Ozark Mountain Publishing has grown beyond any of Dolores’ wildest expectations and now publishes her own 17 books as well as the work of over 50 authors with over 60 titles to its credit. To date, Dolores’ books are published in 20 different languages across four continents. The information contained within them is unrivaled anywhere for its breadth and depth. Readers can choose from topics as diverse as reincarnation, UFOs and Extra Terrestrials, Nostradamus and most recently, they can explore the depths of life on this planet, other planets, universes and even dimensions from her series The Convoluted Universe. Her most recent book, The Three Waves of Volunteers and The New Earth was published in response to the volume of information coming from her clients to do with what she has termed Volunteer Souls who have come to Earth to assist Humanity as a demonstration of Oneness. In the 1960s, Dolores and Johnny were using simple hypnosis for habits (stop smoking, lose weight, etc.). Dolores was first introduced to reincarnation in 1968 when she and her husband were asked by one of the doctors at the naval base he was stationed at in Texas to help one of his patients using hypnosis. Midway through the session, the woman unexpectedly began describing scenes from a past life where she was a flapper in a gang, living in Chicago in the roaring 1920s. Dolores and Johnny regressed the woman through five different and distinct lifetimes back to when she was created by God. The entire story of this event is told in the first book Dolores ever wrote, Five Lives Remembered (2009). 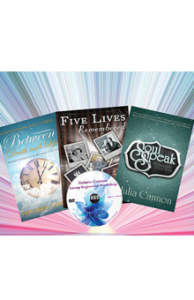 These sessions took place at a time when past life regression was a near unheard of concept. There was no New Age movement yet, and there were simply no books, instructions to guide or resources they could use for a case like this. This, however, proved to be a blessing in disguise. As a result of not having anyone to tell them what to do, how to do it or what was or was not possible, they experimented with insatiable intrigue and enthusiasm. Later that same year, Johnny was almost killed by a drunk driver in a horrendous automobile accident on his way to his Naval Base. As a result of his injuries he was confined to a wheelchair for the rest of his life as a partial amputee. During this time, Dolores’ explorations in hypnosis and reincarnation took a back seat as she was completely focused on her husband and raising their four children. Once the children had grown and left home, Dolores decided to begin consistently practicing hypnosis again with clients in the late 1970’s. Her early work was heavily focused on reincarnation, which got her acquainted and comfortable with the concept of time travel. Many of her early clients described scenes from past lives where they had lived in past decades, past centuries and even past millennia in a variety of social settings in different locations all over the Earth. She would then spend weeks researching the characteristics of life in the locations and time periods her clients had described to verify the authenticity of the results she was recording. It was through this vigorous verification process that Dolores ensured the authenticity of her results. This resulted in her early books: Jesus and the Essenes, They Walked with Jesus, A Soul Remembers Hiroshima, and Between Death and Life. Throughout the mid to late 1980’s, Dolores’ work slowly began taking her in a completely new direction of exploration. Her book The Custodians (1998) signified a ground-breaking publication for Dolores after more than 20 years regressing clients with ET and UFO experiences. We learn that almost all so called abduction cases are actually mutual agreements made prior to incarnating for the purpose of helping one another. Other books, which were published as a result of Dolores’ explorations into the fields of UFO activity and Extra- Terrestrials, include Legacy From The Stars (1996), and the Legend Of Starcrash (1994), the story of the origin of the Indian races in America. Throughout her career, Dolores identified a pattern in many of the clients she saw over the years. While many people reported past lives in all types of situations, societies and cultures on Earth throughout many different time periods, certain individuals who came to see Dolores described that the life they were currently living was the first and only life they have ever had on Earth. When asked where they were from, they simply say the “Source” and they express deep sadness they are here and how much they miss “home.” Further sessions with such individuals revealed that first time incarnates have actually volunteered to come to Earth at this specific time with the intention of helping humanity raise its vibration in the process of ascension. Thus, these beautiful souls have an extremely difficult time adjusting to our chaotic world and have a vital role to play as they help all of the rest of us create a New Earth. Such was the volume of information that was coming to Dolores from her hypnosis subjects that she wrote a book about it, entitled The Three Waves of Volunteers and The New Earth, and published by Ozark Mountain Publishing Company in 2011. As she explored further, she gradually became aware that the information she had received about past lives, different periods in time and a variety of other topics were not actually coming from the conscious minds of the clients she was hypnotizing. Just as developing her technique of hypnosis came slowly and with great patience, so too did the answers to these questions. After many years of practice and investigation, Dolores eventually realized that the memories of past lives and the additional information she had received through clients was being supplied by a much larger, more powerful and more knowledgeable portion of her clients’ selves, which their conscious minds were completely unaware existed. She decided to label it The Subconscious, or what she affectionately also refers to as “They” as it was a part of every person’s mind that exists just below the level of our conscious minds, observing everything. It can be defined as: the Higher Self, the Oversoul, the Higher Consciousness. When contacted and communicated with, there is simply no question it cannot answer about an individual’s current life, or about any of their past lives. Quantum Healing Hypnosis Technique was created by Dolores who had developed and refined it over her 45 year career as a regressive hypnotherapist, working with thousands of clients in countries all over the world. It is through the use of her technique with clients that Dolores not only obtained the information she used in her books, talks and teaching the course, but with which she enabled her clients to experience the instantaneous healing of any physical disease. The name Quantum Healing Hypnosis Technique is derived from the fact that the results achieved and experienced by her clients, both on an informational basis and in terms of physical healing, transcend many of our long held beliefs of what both conventional science and medicine consider possible. Her technique involves inducing an individual to the Somnambulistic state of trance through visualization, a state which under ordinary circumstances is experienced only twice daily: the moment just before you become consciously awake and the moment just before you drift off and fall asleep. Historically, hypnotists have avoided conducting research with patients in this state because of the strange and often inexplicable results that are recorded. Not one to be limited by this disciplinary stigma, it was working with clients specifically in the Somnambulistic state and exploring the possibilities that led Dolores to discover that 90% of individuals can gain access to experiences of Past Lives they have lived. It was also exploring with clients in this state that she discovered an infinitely knowledgeable and powerful aspect of each individual can be contacted and communicated with. This part of ourselves, as Dolores had learned, is always present, existing just below the surface of our conscious mind, so she appropriately chose to label it The Subconscious. The Subconscious is what gave her and practitioners of her QHHT technique access to past lives and performs instantaneous healings when appropriate.